If you subscribe to our Constant Contact email news, you are already aware that we brought back our popular SPECIAL OFFER – DESIGN OF THE MONTH. Last month we featured ANATOLIA. This month, it’s MOROCCO STRIPE. We now offer 9 different color choices in 5 different sizes. On the cross-point online website, you will find a listing of companion pillows that are related in color. I recently added another colorway to Morocco Stripe: the ever popular combination of “blue and white”. These are perennial summer colors, shown each year in all decorating magazines. I wrote at length on these pages about “blue and white” (please see Color Schemes – Summer – Sea and Sky). Since then I also added Balouch Stripe in Mediterranean blues and white and now Morocco Stripe. No matter which pattern, these colors are refreshing and so “summery”. I hope they inspire you to stitch an entire room full for your summer. 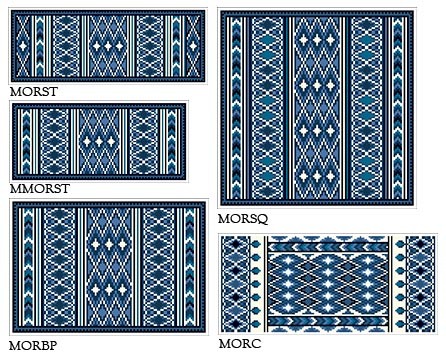 This entry was posted in Blue & White colors for summer stitching, Summer, Uncategorized and tagged About cross-point, blue & ocean colors, blue & white pillows, color schemes for stitching, cross stitch kits, Interior Design, Kilim stitching patterns, Morocco Stripe Pattern, needlepoint kits. Bookmark the permalink.